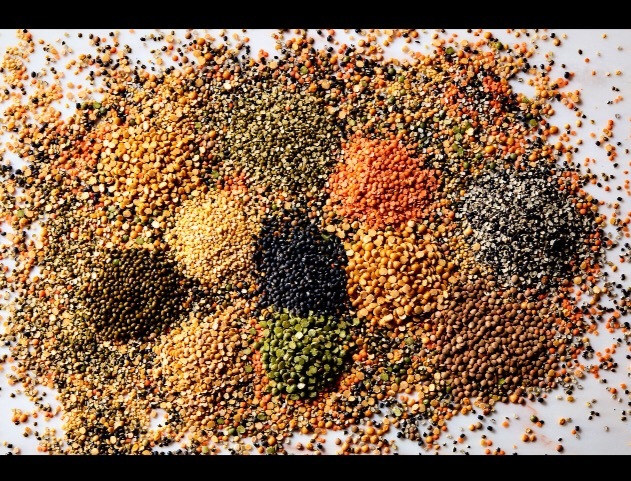 This Epicurious article by Tara O’Brady, with recipe, explains all the different lentils that can be used to make the Indian dish “dal”. Their suggestion to choose your favorite Dal from an Indian restaurant is a great one. Once you know which lentil has been used then you can follow the recipe here to make your own. Enjoy ! Many people assume that Indian food is always complex and time-consuming, and that it requires a pantry’s worth of ingredients. If that were true, we Indians would have given up cooking centuries ago. The truth is, while the cuisine is as vast and as varied as the subcontinent itself, everyday Indian cooking isn’t about elaborate, restaurant-style curries with mile-long ingredient lists. In home kitchens, you’ll find straightforward dishes that use the same smallish collection of ingredients in myriad ways. Take dal, for instance. A simple weeknight Indian meal might include a subzi (Indian-style stir-fried vegetables); a fresh salad like cachoombar (similar to pico de gallo); plain cooked rice, or chapattis or roti (whole-grain flatbreads), and occasionally a not-too-rich meat curry such as keema, or spiced fish or chicken. But at the center of it all, you’ll usually find a simple, and very satisfying, dal. Derived from the Sanskrit word that means “to split”, dal is a collective term for pulses—lentils, peas, and beans. While sometimes used in other dishes, these pulses are usually served slow-simmered into a soft, porridge-like dish that’s also called dal. It’s one of the most widespread and traditional daily foods across India, Pakistan, Nepal, Sri Lanka, and Bangladesh, and like any dish that millions of people cook daily, dal is infinitely adaptable. The type of pulse used, the consistency of the final dish, and the seasonings will be different from region to region and house to house. 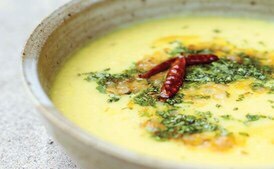 Far from being a side dish, dal is meant to function like gravy. It is what brings everything else on the plate together; not only in terms of flavor, but also in the literal sense when eating with your hands. When served with a grain like rice or a wheat-based bread, dal forms a complete protein that sustains and satisfies for very little expense. There are too many dals on this planet to address them all. Instead, I’ll introduce you to the handful of varieties I cook most often. All of these pulses can be mixed and matched in any combination when making dal—find them at Indian markets or stock up online. Moong dal, the pale, butter-yellow split dal made from hulled green mung beans, is the one my children consider our household standard. It’s one of the quickest-cooking dals, which is probably why I choose it so often. Urad dal, a black-skinned dal with a white interior, is the basis for indulgent butter dal (dal makhani), where it is cooked with dairy, ghee and red beans. Masoor dal is a deep pinkish-orange split lentil (also called “red lentil”) that turns into a gentle golden color once cooked. It’s commonly stewed or used in soups. Chana dal is actually a large category of chickpea varieties, ranging in color from blackish brown to pale beige. Like whole cooked chickpeas, chana dal has an especially earthy, nutty taste. Toor or toovar dal are split and hulled pigeon peas, and taste like a more flavorful version of yellow split peas. They’re especially popular in south Indian sambhar. Always pick over your chosen pulses before using: Just spread them out on a plate or rimmed baking sheet and check for stones or any other bits that aren’t supposed to be there. After that, you’ll want to wash them. Whenever I hear complaints of dal tasting dusty or legume-ish, it’s usually because it wasn’t washed enough. Running the dal under running water in a strainer won’t cut it—instead, submerge the dal in a large bowl of water, swish it around thoroughly, and then drain. Repeat until the water runs clear. By and large, hulled dals will cook faster than their skin-on counterparts, and split dals will cook faster than whole ones. Many Indian home cooks use pressure cookers for making dal, including my dad, but frankly they terrify me a little. Plus, they require more precision when it comes to the ratio of water to pulse. I’m a bit lackadaisical and follow my maternal grandmother’s advice, simmering the dal slowly and adding water as necessary, until it reaches the consistency I’m aiming for. Further, I prefer how dals cooked this way retain more of their textural integrity, compared to the uniformity of those cooked under pressure. To make dal, you’ll always want to start by simmering it in water. Some cooks will start the dal off with onion or salt, but I was taught to save all seasoning for the end of cooking with the exception of turmeric, which is added after the dal comes to its first boil and you’ve skimmed off the foam from the surface. Dal can be thick or quite thin, depending on the where it’s being made and how it’s intended to be used. For moong, I want the dal to be loose enough to puddle on the plate, never pasty. You can easily thicken the dal by simmering it a bit more (uncovered, of course), or thin it out a bit with some extra water. If you’d like to make it smoother (and the dal is already completely tender), just whisk it a few times. Some recipes tell you to puree the dal in a blender, but I rarely do so. Like the word dal, tempering or tardka is a double-duty term in the Indian kitchen. The tardka is both the seasoning itself and the act of adding it to the dal. The tardka is usually made with melted ghee or oil, into which whole or ground spices such as cumin (jeera), coriander seed, clove, cinnamon, cardamom, peppercorns, mustard seed, asafoetida, or fenugreek are fried. Onions, garlic, tomatoes, curry leaves, and chiles—fresh or dried— may also be included. On a festive occasion the tardka might be rather complex, but the basic everyday one I use for moong dal is just ghee, onion, and whole cumin seeds. And maybe a split chile. I stir most of the tardka into the dal just before serving, reserving a little to drizzle on top. A little chopped cilantro is my other customary garnish. To make the dal, in a medium heavy saucepan, cover the dal with water. Swish the lentils around with your hand, then drain the water through a fine-mesh sieve. Return any dal from the sieve to the saucepan and repeat, washing, agitating, and draining, until the water runs absolutely clear. It will probably take 7 to 10 changes of water. Pour the 3 cups (710 ml) of water into the pot to cover the lentils. Bring to a boil over medium-high heat, skim any scum that rises to the surface, then lower the heat to maintain a simmer. Add the turmeric and cook until the dal is quite creamy, 45 to 60 minutes. Stir the dal regularly as it simmers or it can catch at the bottom of the pan and burn. If the dal starts to look dry before the lentils are cooked, add hot water (from the tap is fine). Season well with salt. About 20 minutes before the dal is done, make the tarka. Melt the ghee over low heat. Fry the cumin seeds for maybe 1 minute, until sizzling and fragrant. Add the onion and chile and cook, stirring, until the onion is very soft and translucent, 15 minutes. When the dal is ready, tip the tarka over the dal, stir to partially combine, then sprinkle the cilantro on top. Serve right away with lime wedges and naan or over rice.